Multi-faceted colour. Shimmering with 3x highlights. What you see is the shimmer. Every colour clean and undiluted. Clarified. Intensified. Absolutely free of flat, matte tones. 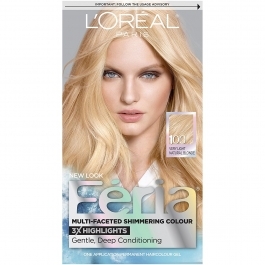 Shimmering colour with 3x highlights that's more multi-faceted than ever before. This luxurious Feria collection includes: shimmering colour permanent haircolour gel, shimmering colour developing cr?me in applicator, aromatic aura, shimmer enhancing conditioner, colourist gloves, insert. PURE DIAMOND is a NATURAL shade that enhances your hair's natural tones. If you are looking to boost gold or red tones, select a WARMER shade. To minimize red/orange tones, select a COOLER shade. Colour Cue: Feria is for all skintones and hairtypes. Colour shown may be achieved on dark blonde or lighter natural hair colour. Darker hair will have darker results; red hair, redder results. Do not use on relaxed or bleached hair. Permed hair, wait two weeks before colouring. Not recommended on predominantly gray hair. IMPORTANT: HAIRCOLOR CAN CAUSE AN ALLERGIC REACTION WHICH, IN CERTAIN RARE CASES, CAN BE SEVERE. THEREFORE, YOU MUST FOLLOW THESE PRECAUTIONS: DO NOT USE IF: You have already had a reaction to a haircolor product. You have a sensitive, itchy or damaged scalp. IF YOU HAVE A TATTOO, the risks of allergic reaction may be increased. PERFORM A SKIN ALLERGY TEST 48 HOURS BEFORE EACH USE OF THIS PRODUCT (see insert). REMEMBER TO BUY YOUR PRODUCT 2 DAYS AHEAD OF TIME. Avoid contact of this product with eyes and skin. If product gets into eyes, rinse immediately. Wear gloves provided in kit. Thoroughly rinse hair after application. Do not use on relaxed hair. Do not use over compound henna or progressive color. Keep product out of the reach of children. Do not apply on children. THIS PRODUCT CONTAINS INGREDIENTS WHICH MAY CAUSE SKIN IRRITATION ON CERTAIN INDIVIDUALS AND A PRELIMINARY TEST ACCORDING TO ACCOMPANYING DIRECTIONS SHOULD FIRST BE MADE. THIS PRODUCT MUST NOT BE USED FOR DYEING THE EYELASHES OR EYEBROWS; TO DO SO MAY CAUSE BLINDNESS. READ AND FOLLOW THE INSERT.